With a highly developed design powered by a 40 volt lithium-ion battery, the Ryobi jet fan blower performs any clearing job with ease. Its outstanding feature is for sure the provision of gasoline-like power, while still having all the advantages of a battery-operated solution. The Ryobi blower provides power at more than 150 miles per hour (mph). Therefore, it is ideally suited for wet and tramped leaves as well as other surfaces which are difficult to process. All in all, Ryobis’ device is one of the strongest 40V battery-operated blowers we have found so far. However, it’s not only about power. The blower has other positive characteristics in many ways. For example, a pretty attractive price and a 5 year limited warranty (please refer to the manufacturers homepage for more information). In this article, we examine the Ryobi 40V blower by taking into consideration the following four criteria: (1) performance of the cordless blower, (2) ergonomy and usability, (3) battery and charging technology, (4) scope of delivery and price. Thereby, we capture all important device features and characteristics which are worth to be discussed. The Ryobi blower is a truly powerful tool which brings it to a maximum air velocity of 155 mph and air volume of 300 cubic feet per meter (cfm). If you need an even stronger performance, you can take the tube off the device. The disassembly of the nozzle supports the bundling of air jet, which increases the generated air pressure. This feature is helpful when processing tramped debris, which can’t be blown away regularly. The 40V blower features a variable speed trigger. If you need a little air, just pull the trigger a bit. If you need the full blast, pull the trigger all the way. By adapting this functionality intelligently, that means always using just as much power as necessary, you can significantly increase the total battery runtime. Logically, the lithium-ion battery takes less energy at lower speed levels. Incl. a battery pack, the Ryobi blower weights more than 10 pounds. Thus, the solution locates around the midfield compared to other battery blowers. Not easy and not heavy. However the blower has a pretty good weight distribution and is therefore easy and comfortably to handle. The Ryobi jet fan blower has an ergonomic design. The battery is located at the top of the device, which gives you an excellent balance. A newly designed soft-grip handle, that lies comfortably in the hand, makes leaf blowing even more convenient. As you can see from the product image, the soft-grip is not completely pulled, but only to around 60%. This design feature allows users a greater flexibility. However, we would prefer it, if the grip was fully pulled as it is the case for most other cordless blowers. The sound pressure level of the Ryobi blower is 73 decibels (db) when operating the device at full power. However, the level decreases when reducing air speed via the variable trigger. Nevertheless, the Ryobi jet fan blower is significantly louder than other 40V leaf blowers, for example the Oregon BL300 or the Dewalt 40V Max XR. The Ryobi 40V blower can either be run with one of two 40V lithium-ion batteries with 1.5- or 2.4 ampere hours (Ah). This corresponds to an energy storage capacity of 54 respectively 86,4 watt hours (Wh) – considering the nominal voltage of 36 volt. Generally speaking, the more Wh a battery has the higher is its maximum runtime. Nevertheless, total runtime does not only depend on the size of the battery pack, but also on how users work with the blower. If you run the blower constantly at full speed, you will only reach runtimes of approx. 15 minutes with the 1.5 Ah battery and 20 minutes with the 2.4 Ah pack. 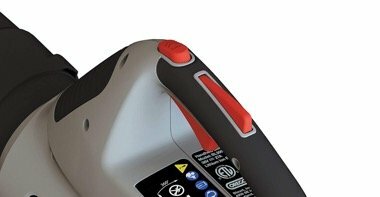 Both batteries feature a LED charge level indicator, that allows to comfortably read the charging status while working with the cordless blower. And that’s not the only positive aspect about the battery’s exterior design, as the lithium pack also has a rubber lining in order to prevent the battery from any damage. Ryobi has a lithium-ion charger to refill the battery with energy. Since the charger only has a relatively low charging current, recharging takes relatively long. The charging time for the compact pack (1.5 Ah) is already 60 minutes. A full charge of the high capacity pack (2.4 Ah) takes approx. 1,5 hours. The Japanese tool manufacturer has a huge versatility of 40V battery-powered devices besides the Ryobi blower. All of them work with the 40V battery platform presented above. In contrast to many other manufacturers, Ryobi does not only offer „standard“ tools such as regular cordless hedge or lawn trimmers, but also rather rare devices, for example a battery-powered snow blower. The Ryobi blower as well as it’s accessories can be found in the middle segment in terms of price. On Amazon, you can either buy the complete kit, consisting of the tool, a battery pack and a charger, or you can select the components individually. Prices in the internet usually vary from day to day. Hence it’s definitely worth a look at what is most beneficial at the date of purchase. In 1943, Ryobi was founded in Japan (Japanese name: Ryobi Seisakusho Co., Ltd.). Today, Ryobi Limited is a worldwide manufacturer of die castings, builders’ hardware, printing equipment, as well as power tools. It owns companies in Asia, the United States and Europe. With regards to power tools, Ryobi is one of the world’s largest producers specializing in the development of pro-featured tools at affordable prices. Thus, millions of homeowners, hobbyists, outdoor fans, woodworkers and craftsmen all over the world today use Ryobi tools. 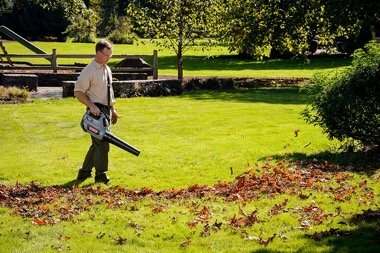 Whether you are a professional landscape gardener or an ambitious homeowner, the Oregon cordless blower 40V BL300 will make the grade. It has a very strong motor just as a gasoline blower, but still provides all the benefits of a battery-powered device, such as a reduced noise level and low tool weight. One of its major benefits is definitely its high performance. Its max air speed and volume data are comparable to those of a gas-operated blower, that means you get gas-like power in a comfortable package. However the Oregon BL300 is not only very powerful, but also has many other advantages. Moreover, power isn’t the only important criterion to consider when making a buying decision. It’s always a good idea to consider all product aspects when deciding upon the right tool for your project. In this review we’ll also look at the usability of the 40V Oregon blower, available technology as well as acquisition cost. The review further contains a summary of features and specs as well as a short excursion into Oregon’s history. The Oregon BL300 has a very strong brushless motor and optimized fan to maximize the output of the blower. It’s truly a high performance tool, which is not only suitable for private home owners, but also for commercial and professional use. The power of the device can be either controlled with a variable speed trigger or the turbo boost can be applied. If you use the variable trigger, you can reach an air velocity of 102 miles per hour (mph) and air volume of 400 cubic feet per meter (cfm). Using the turbo button will run the device with a maximum speed of 132 mph and generate a volume of up to 507 cfm. The combination of a variable speed trigger and a turbo button guarantees highest possible flexibility for operators. On the one hand the trigger can be used when long run times or on-demand power is needed. On the other hand the turbo button gives you the additional performance needed to move the really tough yard debris. 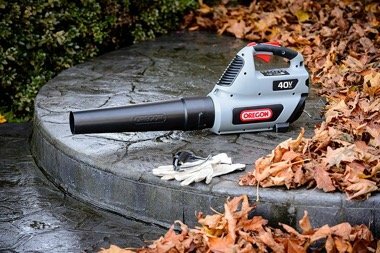 The Oregon cordless blower weights 6.2 pounds (standalone). The weight of the complete kit, i.e. incl. a battery pack, can go up to 9 pounds depending on the battery size (between 1.7 and 2.9 pounds). Altogether, the Oregon solution was by far the lightest, which we analyzed during our annual 40V leaf blower reviews. In addition to its relatively low weight, the Oregon BL300 has a very ergonomic design. The device does not only rest comfortably in the hand, because of its well-designed soft grip and extralarge buttons, but also due the tools’ eminent balance, meaning that the blower doesn’t annoyingly tilt forward or backward at all. Another nice ergonomic feature is that the air tube can be removed from the engine, which might save some storage space. When using the variable speed trigger at high the Oregon blower has a noise level of 60.8 decibel. The noise level goes up to 64.6 decibel when applying the turbo button. According to the manufacturer’s website, noise levels were tested per ANSI B175.2 bystander sound pressure. In this context, it is important to note that the Oregon BL300 had the lowest noise level of all 40V blower reviewed, as for example the 40V device from Dewalt or the Ryobi jet fan blower. The Oregon blower can be operated with three different 40V lithium-ion batteries which have capacities of 1.25 ampere hours (Ah), 2.4 Ah and 4.0 Ah. Taking into consideration the nominal voltage of 36 volts, this is equivalent to an energy storage of 45 watt hours (wh), 86,4 Wh and 144 Wh per battery (whereas one unit of energy corresponds to one watt of power expended for one hour of time). The actual runtime of the battery pack depends on two factors. Firstly the size of the battery, i.e. how much energy can be stored. Secondly, the way you use the cordless leaf blower. Let’s take the biggest battery, the 4.0 Ah pack, as an example: If you use the variable speed trigger, you can work up to 90 minutes with the blower as long as you run it at low power. If the speed trigger is fully pressed, the runtime will be around 15 minutes only. And if you exclusively use the power boost, runtime will be even less than 10 minutes. However from a user’s perspective, it’s rather seldom that you need the power boost for more than 2 or 3 minutes without a break. Logically, the smaller battery packs with 1.25 Ah and 2.4 Ah last less than the 4.0 Ah battery. We recommend to buy the biggest pack, if you need to run your cordless leaf blower at high speed. Please also be aware that the power button doesn’t work with the 1.25 Ah battery pack at all. All batteries can be either recharged with a standard battery charger (C600) or a fast charger (C750). You can recharge the batteries in 30 minutes (1.25 and 2.4 Ah battery) to 60 minutes (4.0 Ah battery) with a fast charger. It takes double the time or longer if you use the standard charger. For example, it takes around 4 hours to fully charge the 4.0 Ah battery pack with the C600. The just presented batteries and chargers can’t only be used in combination with the Oregon BL300, but also with many other 40V battery tools from Oregon, as for example pole saw, hedge trimmer, edger, chain saw. Potential buyers will find Oregon tools and products in the higher price segment. Quality simply has its price. You have the option to either buy the tool only (for example if you already possess Oregon batteries) or to purchase the full package (for example including a 4.0 Ah battery and a rapid charger). Usually you achieve lower component prices if you buy the complete kit. The Oregon Saw Chain Manufacturing Corporation was founded in 1947 with only four employees and one single product. Today, Oregon is one of the world’s top names in saw chain, sprockets, guide bars, outdoor equipment parts, and forestry accessories. The Oregon brand belongs to Blount Inc., a corporation with more than 3,000 employees and thousands of products sold in more than 100 countries worldwide. The company focuses on manufacturing products that offer a superior competitive advantage and hold leading market share positions.